The Executive Board of Van Lanschot Kempen is leading the core activities (Private Banking, Evi van Lanschot, Asset Management and Merchant Banking). The Executive Board consists of the members of the Statutory Board of Van Lanschot Kempen N.V. and the members of the Management Board of Kempen & Co N.V. The members of the Statutory Board of Van Lanschot Kempen N.V. together form the Statutary Board of Van Lanschot N.V. The media kit provides you with high resolution photos of the members of our Executive Board, Supervisory Board and head offices. Corporate Banking, Evi, Company Secretariat/Legal, Strategy & Corporate Development, Human Resource Management, Communications, Compliance, Group Audit and Van Lanschot Belgium. Karl Guha fulfils two board positions. Constant Korthout (1962) was appointed Chief Financial Officer / Chief Risk Officer and member of the Statutory Board of Van Lanschot NV in 2010. Mr Korthout studied Business Economics at the Erasmus University in Rotterdam. He started his career in 1985 as a management trainee at the former ABN Bank, followed by a number of years as senior account manager for corporate clients at the bank. In 1990 he became Financial Management Consultant at KPMG Management Consultants. He joined Robeco in 1992, starting as Group Controller and subsequently holding the positions of Chief Financial Officer and member of the Executive Board of Weiss, Peck & Greer in New York, and Corporate Development director. In 2002 he was appointed Chief Financial Officer of Robeco Group. In this position his responsibilities included Risk Management, Treasury and Corporate Development. Constant Korthout holds a total of three board and supervisory positions. Arjan Huisman (1971) was appointed to the Statutory Board of Van Lanschot NV in 2010. Mr Huisman studied Business Economics at Erasmus University Rotterdam. He started his career in 1995 as a Consultant with BCG in the Netherlands. From 1998 to 2000 he was based in BCG's office in Boston. He was appointed Partner and Managing Director at the end of 2004. From 2004 to 2007 he managed BCG's office in Prague. He returned to the Netherlands in 2008. Member of the Supervisory Board of Van Lanschot Chabot Holding B.V.
Arjan Huisman holds a total of four board and supervisory positions. Richard Bruens (1967) was appointed to the Statutory Board of Van Lanschot NV in 2014. Mr Bruens studied Business Administration at the University of Groningen and has an MBA in Finance from Manchester Business School. He started his career at ABN AMRO in 1991 as management trainee in the international division, holding various managerial positions in the Global Markets division, both at head office and internationally, until 2007. During this period he worked in several countries including the UK, Greece and Saudi Arabia. He was based in Amsterdam from 2002 to 2007, the last four years in the role of Managing Director of Investor Relations. He left ABN AMRO in July 2007 to join the Group Managing Board of Renaissance Capital in Moscow, where he was responsible for strategy, investor relations and communication. In January 2010 he returned to ABN AMRO in the Netherlands, becoming a member of the ABN AMRO Private Banking International management team, with global responsibility for Products and for Private Wealth Management. 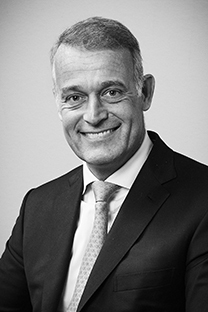 Mr Bruens joined Van Lanschot on 1 August 2013 as Managing Director of Private Banking. Member of the Supervisory Board Feyenoord. Richard Bruens holds a total of five board and supervisory positions. Leni Boeren (1963) is chair of the Managing Board of Kempen & Co since 5 February 2018. Leni Boeren has a Master’s in Business Management from Erasmus University in Rotterdam. Leni started her career in the financial sector as an account manager at Paribas in 1983. She went on to work for Rabobank Groep from 1984 to 1992, where she held various positions. She headed Robeco’s marketing and product management department from 1992 to 1997. From 1997 to 2000 she was a member of the board of directors of Amsterdam Exchanges with responsibility for marketing, products and sales. In 2000, she was appointed member of the Executive Committee of Euronext, with responsibility for a.o. strategy, marketing, pr, product development, indices, institutional and private clients sales and the information services division. From January 2005 till December 2016 Leni Boeren was a member, and later chair, of the management board of Robeco Groep. She was also responsible for a number of subsidiairies, including Robeco Direct, Robeco Institutional Asset Management, Boston Partners Global Investors, Harbor Capital Advisors and RobecoSAM Sustainable Asset Management. She also served as a member and chair of the board of DUFAS, the Dutch Fund & Asset Management Association from 2009 to 2016. Member of the Board of Directors and member of the Audit Committee and the Sustainable Development and Compliance Committee of Air France-KLM S.A. Member of the Board of Directors of FCLT Global. Leni Boeren fulfils a total of five board and supervisory roles. Leonne van der Sar (1969) became a member of the Kempen & Co Management Board from 1 August 2017. Leonne van der Sar studied Econometrics at the Erasmus University in Rotterdam and started her career as a trainee with ABN AMRO Bank in 1993, where she held various positions within Investment Banking. As Managing Director of ABN AMRO Rothschild and a member of ABN AMRO’s global management team between 2004 and 2006, she held ultimate responsibility for equity capital markets activities in the Netherlands. She then took on the executive directorship of ABN AMRO Corporate Development. From 2008 she became an independent consultant and project manager, facilitating a series of major integration and change projects at the interface of IT and commercial operations for various Dutch and international financial institutions. Since 2014 she has been responsible for Strategy & Corporate Development at Van Lanschot Kempen, leading projects in the fields of strategy, M&A and capital markets. The members of the Supervisory Board of Van Lanschot Kempen are appointed by the General Meeting of Shareholders. The members of the Supervisory Board are also the members of the Supervisory Board of Van Lanschot N.V.
Willy Duron holds a total of three board and supervisory positions. Manfred Schepers holds a total of six board and supervisory positions. Jeanine Helthuis holds a total of seven board and supervisory positions. Bernadette Langius holds a total of five board and supervisory positions. Lex van Overmeire holds a total of three board and supervisory positions. Maarten Muller holds a total of two board and supervisory positions. Frans Blom holds no other board and supervisory positions. The Supervisory Board has appointed four committees from among its members: an Audit & Compliance Committee, a Risk Committee, a Selection & Appointment Committee and a Remuneration Committee. Van Lanschot Kempen’s issued share capital consists fully of ordinary A shares. More than 99.9% of the ordinary A shares are held by Stichting Administratiekantoor gewone Aandelen A Van Lanschot Kempen (the Trust Office), which has issued depositary receipts for those shares. The depositary receipts are listed on the Euronext Amsterdam Stock Exchange. The protective function of issuing depositary receipts for shares was lifted in 2006. This means that, in line with the Dutch Corporate Governance Code, the Trust Office will in all cases allow the holders of depositary receipts to exercise their voting rights. Each voting shareholder is authorised to attend the shareholders’ meeting, address the meeting and exercise the voting right. Each share entitles the holder to cast one vote in the shareholders’ meeting. Additional information on the rights of shareholders and the main powers of the shareholders’ meeting are as follows can be found in the Corporate Governance section of the 2018 Annual Report (page 86 and further). Van Lanschot Kempen N.V. is a two-tier board company and the holding company of Van Lanschot N.V. Kempen & Co N.V. is a subsidiary of Van Lanschot N.V.
Simplified legal structure Van Lanschot Kempen N.V.